A few weeks ago I put up my 100 Pages post on Rana Dasgupta’s Tokyo, Cancelled. While I didn’t like the book, I couldn’t completely bring myself to dismiss the author (which explains my posting an incomplete review). 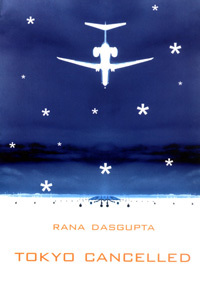 So, in the spirit of fairness, here’s a link to an insightful review of Dasgupta’s recent novel Solo at the blog Asylum. Enjoy your weekend! I’ve been a fan of The Sartorialist blog for a long time. So when a companion book was published collecting some of the great photography from the site, I rushed out to buy it – literally was at the bookshop looking for it the day it was released. Why am I a fan? Because you won’t find a lot of super models in Scott Schuman’s book or on his blog. The Sartorialist is less about fashion, more about style. The photographs are of random (and some familiar) people he sees on the street – taken on the spot in a composition style that always reminded me of August Sander. And it says a lot about his work that designers use Schuman’s street photos for inspiration – versus his doing photo shoots with models dressed head to toe in the latest look (though he does some of that too). And now The Sartorialist, in book form, gives you 512 pages of people looking fabulous without having to turn on your computer. That caught him off guard. I followed up my first response with, ‘So, is that southern Italian tailoring?’ It was, and I knew it was, and my recognition of that was what won him over. A longtime friend of mine, David Allen, once told me that one of the basic needs of people is to be understood. I think that the fact that I seemed to understand this man and what he was trying to communicate through his style is why he agreed to let me take his photo. He goes on to talk about how he received an overwhelming response to the photos of this well dressed man after posting them. Other men, with similar body types, were printing the photos off their computers and taking them to stores because they wanted style – but didn’t have a blueprint to follow. Normally, I’d post some of my favorites here. Instead, check out The Sartorialist and find your own. Scott Schuman also has a monthly article in GQ Magazine, with more of the same. My favorite, though, is still the blog. If you saw my post yesterday you’ve already gone to look at Bookduck. If not, what are you waiting for?! Click here. I had the opportunity to ask Sarah, the blogger behind Bookduck, some questions. I hope you enjoy our interview as much as I did. I love the story about how your blog, Bookduck, got its name. Can you tell it again for readers who haven’t visited your blog yet? And I couldn’t help wondering…was Duck ever your nickname? My name is Sarah, which starts with an “S”. With the addition of a simple beak and a dot for an eye, cursive “S”s look a lot like ducks. An older girl in my neighborhood showed me that when I was just learning cursive, and I’ve been playing with it ever since—although I don’t use it on my real signature. Add that to the fact that I like books, and you get “Bookduck”. Duck, however, was never my nickname. Bookduck has been around since 2008. I started on Livejournal and moved my reviews over to Blogger this summer. I still mirror my posts on Livejournal. So after almost a year of blogging, what do you feel your roll is as a book blogger? I feel that my role is to post reviews that will help people find books that they are likely to enjoy. As a reader of reviews, I find more books I like because a) I now know they exist and b) a good review often leads me to books I would’ve rejected after seeing the cover and reading the book jacket. Book blogging also gets people talking about books, which is rarely a negative thing. Is that why you started Bookduck, to get people talking? I started Bookduck for fun as well as to keep track of what I liked/disliked about what I read. Also, I read a lot of book blogs and one day decided I wanted to join the discussion. I don’t have any big plans for Bookduck, but I would like to try doing more interviews in the future —bloggers, authors, readers, whatever. I do have an author interview coming later this year, and I’m incredibly excited about it. I’d love for something like that to come up again, but if it doesn’t I won’t be heartbroken. As I said, I started Bookduck for fun—and I hope it stays that way. And you post music to Bookduck as well. (I love the videos!). Do you consider BookDuck primarily a book blog? Most of my posts are book related, so I would say yes: Bookduck is primarily a book blog. When I read other book blogs, however, I enjoy reading occasional posts about other topics like current events, art, music, and movies. It’s also interesting to hear a little bit about the person whose reviews I am reading. I like to post about whatever interests me or might interest others. What kind of books can a reader expect to find reviewed on your blog? I read mostly YA fiction with the occasional adult novel or work of nonfiction. As far as genres go I read all over the place, but I do enjoy books that contain realistic fantasy–as in something out of the ordinary that occurs in an ordinary situation and feels like maybe it could really happen. This often takes some research–for example, historical–on the part of the author. Would you say you lean more towards historical fiction or more towards fantasy? That’s difficult–I like them both. I wanted to ask you about your reviews. Do you try to stick to positive reviews or do you post about the books you don’t like as well? I mostly post positive reviews of books I enjoy because I’m absolutely terrible at finishing books I don’t enjoy—I have too little free time for that, and since Bookduck is just for fun I don’t feel bound to finish every book I touch. In other words, if I finish a book it’s automatically an okay read. It does not, however, mean that I’m in love with it, and I often have complaints. This is where it gets fuzzy because I want to be honest without being rude. On the other side of this, just because I put aside a book today doesn’t mean I won’t pick it up later and find it un-putdownable. Some of my favorite books are ones I couldn’t stand when I first cracked them open. That’s a great word “un-putdownable”! What are some of the books you’ve changed your mind about – that went from put aside to un-putdownable? I’m sure there have been more, but this is what I’ve got off the top of my head. When you’re looking for something to read to you go to the any traditional book review outlets – like the NY Times or Entertainment Weekly? Not on a regular basis, no. So you stick mainly to the blogs? Yes. The great thing about blogs is finding people who tend to like books you like, which makes finding books to read easier. Did you discover these bloggers before or after you started blogging? I discovered them before I started blogging. They were fun to read, and suddenly I started finding all these fantastic books I never knew were there. And I was hooked. Were you influenced by other blogs? Any recommendations? The blogging community has affected my blog by being an example–seeing what people write about and how they deal with their layout has definitely shaped Bookduck. And the blogging community has definitely effected how I read books! I’m now more careful to note what I think about books as I read, and also to try to read books I don’t like. Having people to be accountable to makes the page turning easier. My favorite sources of inspiration are Bookshelves of Doom (http://www.bookshelvesofdoom.blogs.com/), The Story Siren (http://www.thestorysiren.com/), Natural/Artificial (the author blog of Stephanie Perkins) (http://www.naturalartificial.blogspot.com/), and Grow Wings (the author blog of Laini Taylor) (http://www.growwings.blogspot.com/). They’re all great reading. There are a lot of book blogs out there, so there’s a little something for everyone. Which is great. So, here’s the hard question. What’s your book of the year? Ooh, that’s a tough one… So far I really like Eyes Like Stars by Lisa Mantchev. It’s funny and smart and I got lost in it. Sarah, thank you so much for the interview!